LOCAL LIVING // AUSTRALIANS are used to buying packaged produce. We buy bottled water, nuts come in the same wrapping as crisps, and even apples now come plastic wrapped. Above: Tammy Logan. Photo supplied. First published in the 11 December 2015 print edition of the Warragul & Baw Baw Citizen. All dates relative to then. 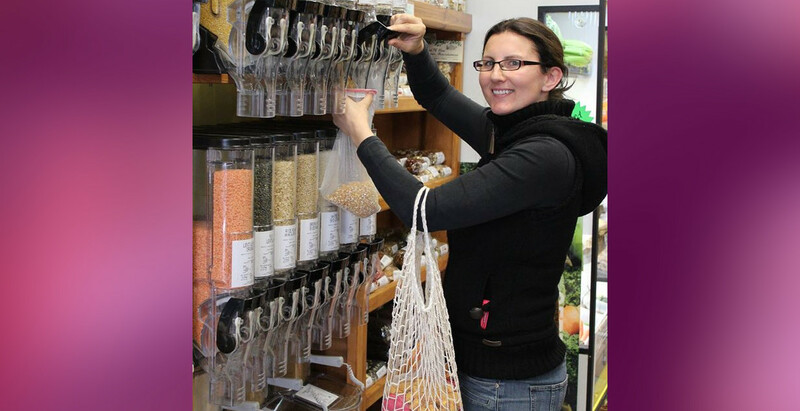 So standard is our use of disposable packaging, when Tammy Logan started bringing her own containers to shops in West and South Gippsland she was often met with confused looks. Tammy now runs the Gippsland Unwrapped website from her Nyora home and campaigns for others to reduce their reliance on packaging, be it wrapped around food or Christmas presents. She also publishes articles on recycling household objects. Her household of two adults and two kids produces only a handful of landfill waste in a week. Tammy spoke to WBBC about Gippsland Unwrapped. WBBC: One of your priorities has been to reduce the amount of packaging you take home from grocery shopping. How have shops responded to you turning up with your own containers and bags? Turning up with containers to the butcher and delis has been the most nerve-wracking of changes. The majority of places I have done this at have been really positive, but a couple have been a little negative. I think [that is because] it is such a new request for a lot of people and they feel uncomfortable with doing something different. I have found that many assistants have not been shown how to tare the weight of other containers on their scales. For each new person who serves me I need to explain why I’ve brought my container, otherwise they will still do things like weigh the goods in the plastic bag or fill the bag and put the bag in my container or use the bag as a glove and then throw it away. Now though I go to places which know what I am doing and are very positive about it, so no need for a big explanation every time I go shopping. Again, other customers watch me with interest and some have said what a great idea it is to use containers. WBBC: You had an issue with a major supermarket refusing to use your containers a while ago – all sorted now? Tammy: No. Woolworths will not do it. It is not against the law to use containers but they can refuse based on their own policies. It is a shame because the convenience of a supermarket is such a draw card for a lot of people, but I prefer the fact I shop a lot more in small local businesses instead now. WBBC: How much have you decreased your landfill waste by? Tammy: We weren’t too bad by some people’s standards. We never had a full red lid bin at the end of the week, maybe half to three quarters full. Now we only send a handful to landfill each week. I also used to have a very full recycling bin every two weeks but now we have reduced that to about a bucket per week. We are at the stage where the things being recycled are pretty difficult to do something about, like paper from school and kinder or packaged treats given to our kids by others. Food and hygiene products are really the only things we ever buy. I try to be a very low consumer and am having to make a lot more of those things from scratch, but I can’t do everything all the time so I buy my pasta in cardboard boxes and we get the occasional alcoholic drink in bottles, for example. Everybody who wants to have a go at this can only work with what’s available to them. In the city they have bulk stores which are just like a package free supermarket, but we don’t have that here so I visit multiple stores and markets in several towns to cover as many of my needs as possible. I tie the trips in with other things I need to do. WBBC: Do you spend much more time shopping than before you started this as a result? Tammy: Initially I did spend more time shopping than before because I had to learn where to find things, but now I can get most things pretty quickly in one town by going to the butcher, baker and a grocer. It doesn’t really take up more time. What does take up more time is baking and cooking. I was all about time saving options before so didn’t spend much time doing this. Now I make muesli bars, biscuits, jam, kombucha, yoghurt, deodorant, all sorts of things. I love that I have learnt so much and we are becoming more self sufficient. WBBC: So you have enjoyed the transition? Tammy: I have. I feel much better within myself for doing less harm to the environment and showing my kids to stand up for what they believe in. It doesn’t matter if you are a bit different, you should always be yourself. We also eat healthier so I feel physically better, and we have saved money. WBBC: What advice would you give someone looking to reduce their waste like you have? Tammy: My advice is that practice makes permanent, not perfect. Mistakes will happen but just continue to try a make better choices each time you purchase something. Definitely start with what you already have – don’t throw away useful things in your haste to be plastic free or zero waste as that is also being wasteful. It also means that before you buy something you should think about whether you can make do from things you already have. Reducing waste doesn’t only relate to food, it also means thinking about your clothing, cleaning products, entertainment choices, gifts, et cetera. If it seems overwhelming, tackle one thing a fortnight and at the end of the year you will have made 26 significant changes. The Gippsland Unwrapped website (click here) and Facebook page (click here) have local information for anyone looking to reduce their waste. Reduce your gift recipient list. Nobody really likes filling their home with clutter they’ve received from excessive gift giving. This clutter will soon end up in landfill. Make memories by giving experiences instead of things. Research has shown that, beyond basic necessities, experiences make us happier than stuff does. Make it or find it secondhand. Homemade and quality secondhand gifts are acceptable and sustainable ways to show someone you care. You can also make or find secondhand decorations, including advent calendars. Give up Christmas cards. Don’t give out Christmas cards to every-one you know and let others know you would rather not receive any. If you do receive cards, find ways to reuse them. Refuse, reduce, reuse and recycle wrapping paper. Think about whet-her wrapping a present is really necessary. You could use gift bags that are easily reused over and over again. I have not bought wrapping paper for about 10 years because I keep the wrappings that we are given to reuse when we give a gift. The children also like to use their artwork to wrap gifts that they give. You can avoid plastic sticky tape by using string which can be reused or you could use cloth and learn the Japanese art of furoshiki. Use reusable decorations. Ensure you only use reusable decorations and, if you are starting out your collection, focus on obtaining beautiful items made sustainably from natural materials. Bring your own. Don’t forget to shop for food, gifts and other neces-sities using your own containers and bags to minimise the amount of disposable packaging. Use reusables wherever possible. During festivities use reusable plates, bowls, cups, cutlery and napkins. Washing up is easy in the dishwasher and washing machine. At our house we have a collection of ‘ugly’ mugs and mismatched glasses, some reusable plastic cups, and so on which we bring out for parties. If something breaks, which rarely happens, we can replace it from the opportunity shop. I know people who have a family party pack full of reusables which gets passed around to relatives when they throw a party. I think this is a great idea. Prepare and store food properly. Make sure you cater accurately and store leftovers appropriately so food is not wasted before it can be eaten or made into some other meal. Use a real Christmas tree. Real Christmas trees are a renewable resource as they are replanted each year, helping to remove carbon from the atmosphere. They can be composted after Christmas.